What would you do if the emoji keyboard suddenly disappeared from your phone? Personally, my twenty-first century reflex would have me desperate to tweet a distressed face emoji, and this dependence on using the familiar little icons as forms of expression is not something I am alone in. In a fast-paced, digital life, the emoji keyboard has become our go-to response to express ourselves emotionally and is being dubbed as the fastest-growing language of the twenty-first century, transgressing traditional language barriers. It’s quick, effective and can even replace words when you’re on the go and need to show your face when the Whatsapp group chat is on fire and you just don’t have the time. The emoji language isn’t just confined to our personal lives either – aside from sending a cheeky cake emoji round the office to signify a colleague’s birthday, many brands have now tapped into the new digital language. A 2016 study by Appboy demonstrated the fast-growing rate of brand emoji use. The report detailed that the presence of emojis in marketing messages sent out via email and mobile has increased by 777% since the start of 2015, based on over 9,000 marketing campaigns. In 2015, Domino’s introduced a new way of ordering in the US, whereby customers need only tweet a pizza emoji to the takeaway giant to place their order – get me to America now. 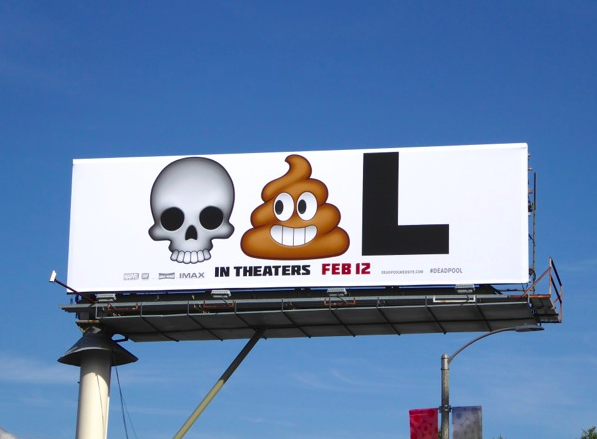 The recent Deadpool movie tapped into the light-hearted nature of the film’s superhero, with billboards simply showing the ‘skull face emoji’ + ‘pile of poo emoji’ (never thought I’d write that in a professional blog post) + the letter ‘L’ (see above). Needless to say, it got marketers and film bods alike talking. While it is undeniable that emojis have become part of our every day life, both in a personal and professional sense, the beauty of these icons is that they add emotional value to words which has previously been unattainable. The new creative opportunities which have arisen for consumer brands by being able to tap into expression is one which must be used tactfully, rather than throwing out a monkey emoji in every sentence (guilty). It’s a trend which is on the rise, and which will surely be more and more present in brand marketing in the near future. Watch this space.